I met Emmy and 117 other high school students last year during a year-long study of writing instruction in four “culturally and linguistically complex” (Ball, 2009) English classrooms. The high school, situated ten miles east of an urban emergent area (Milner, 2012), has “urban characteristics,” such as high levels of administrative surveillance, acute focus on standardized testing, and high percentages of traditionally marginalized students. However, the teachers I worked with did not subscribe to the standardized instruction, and instead enacted pedagogies atypical in their school. Their instruction and curriculum drew from humanizing and workshop approaches to teaching, which positioned students’ experiences and lives at the center of their rigorous curriculum. It was within this context that the teachers and I learned how to design writing instruction where humanizing dialogue and student talk was the curricular focus. 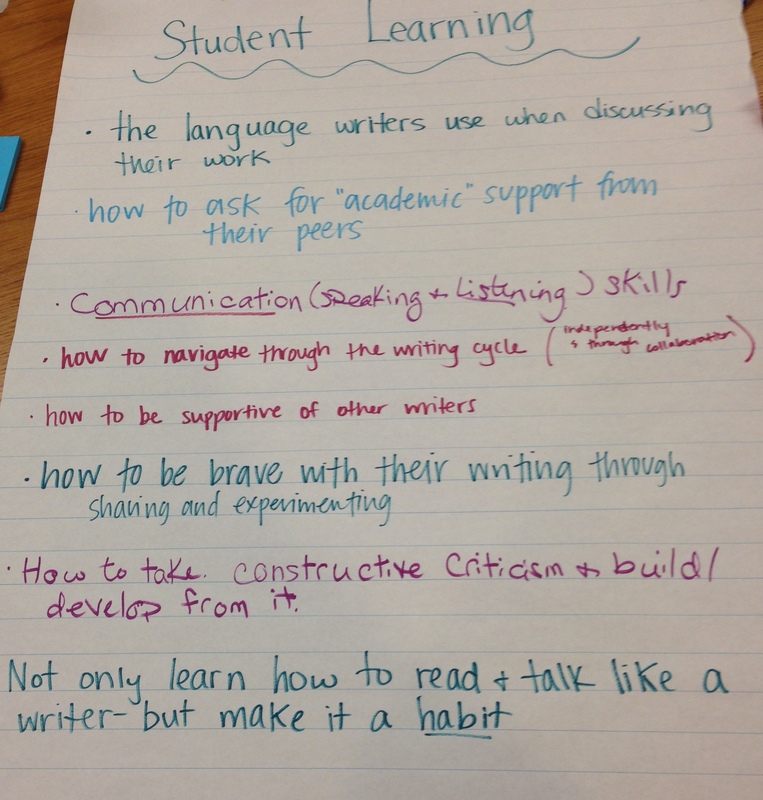 In this post I share what we learned about designing spaces for student writers to share their work and respond to each other as writers, and hopefully convey the potential of writing groups as spaces for student voice and empowerment. The humanizing act of sharing one’s writing is not new. Researcher and scholar Anne Ruggles Gere (1987) once said that “writing groups have existed as long as writers have shared their work with peers and received commentary on it” (Gere, 1987, p.9). Gere’s scholarship pushes back against the myth of writing as a solitary act and asks educators to reimagine writing as a practice that is inherently social and reliant on dialogue with other writers. Following in Gere’s footsteps, both teachers in my study approached writing instruction as a social and process-focused practice. Their writing curriculum emphasized choice, real-world genres, and writing for authentic audiences. Therefore, we designed the writing group curriculum to support these pedagogical commitments across a writing process cycle. For example, when students were still coming up with ideas about topics for writing, a mini-lesson may focus on interviewing as a strategy to collect ideas about a topic. While revising, a mini-lesson may focus on how to use the commenting function on Google Docs to support their talk in groups. In the next section, I continue along this vein and offer advice to teachers interested in starting writing groups in their own classrooms. Listen carefully. Sometimes kids just need to talk, and although it may not sound like it is about or in support of their writing, that talk is often doing really important work (e.g. provide inspiration for ideas for later writing projects; build trust among members). Remember that your students know how to talk, and know how to have human conversations. The short lessons you teach should build on the many resources and strengths they already bring to the classroom. 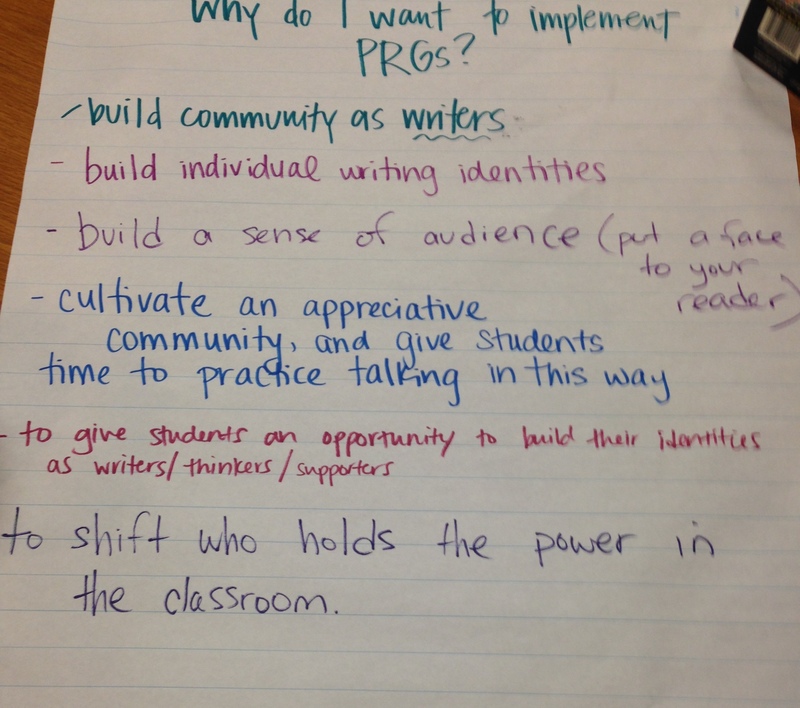 Having a community of teachers who are also implementing writing groups is incredibly beneficial. During our year together, it was helpful to regularly share our experiences, problem solve, get new ideas for lessons, and motivate each other to not give up. I conclude this post with the perspectives of students, who brought wisdom, wit and a lot of laughter to my work this past year. As a part of my research, I interviewed 26 eleventh graders and 13 ninth graders about their experiences with writing, and overwhelmingly they expressed writing groups to be their favorite activity that year. Many students recognized the importance of having another’s “opinions and thoughts on writing” (Tammy, 4/5/18) they had already done, and recognized that the conversations in their group fueled their future writing, making their practice a truly social one. I believe this is what Emmy meant when she said: Other people’s words “might spark something.” Inspired by Emmy’s words, I wonder what could be possible if every classroom had a space for students to use and develop their voice in a way that inspires and shapes another’s creative and intellectual pursuits. What would our schools, and furthermore, our society, look like then? Kira LeeKeenan is a former high school English teacher and doctoral candidate of Language and Literacy Studies at the University of Texas at Austin.